Lots of design advice revolves around big projects – stuff that needs a hefty budget and a full wallet to see through from start to finish. But sprucing up your home doesn’t have to be a major undertaking. If you want to liven up your space without totally transforming it, one of the best (and most affordable) ways to do it is by adding a splash of color. Often, that means re-accessorizing, but if you’re feeling handy and a little ambitious, a small can of paint, a weekend, and a brush or two are all you need to undertake one of these DIY paint projects and add a bold, colorful new feature to any room in your home. One of the most tried-and-true weekend paint projects is to transform a worn-down piece of furniture into a bright, colorful statement piece. This works great both with furniture you already have and cute but worse-for-the-wear pieces you might find at a thrift store or flea market. Furniture that has an attractive silhouette but a dated wood stain is a great choice, because a bright colored paint will hide the age of the piece while showcasing its style. Be sure to remove all the hardware and drawers before you start, and do it right: paint you slap on haphazardly will just end up peeling off. Instead, sand away the glossy coating on the furniture and clean it thoroughly before priming and painting. Adding an accent color to a bookshelf is a personal favorite paint project of mine. It works equally well with built-in bookshelves or bargain-bin ones, and basically any combination of colors. 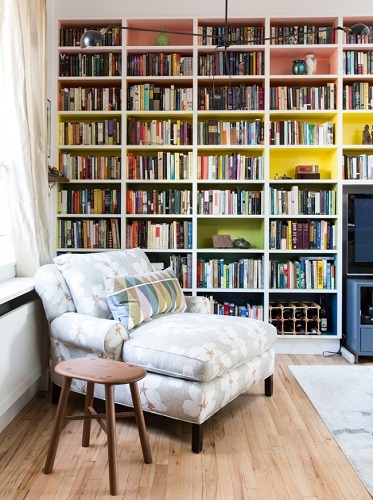 Rather than painting an entire bookshelf (which you certainly can! ), this involves painting just the inside surface and back of each shelf, leaving the outside and front trim of the shelves in their original color. Using a single color (especially one that matches your walls) is a great way to add depth to your living space, since it makes the shelves look backless. But I love a mix-and-match look, that either creates a rainbow of colors, a gradient, or a nice ombre of a single color. Doing it this way lets the color serve as a backdrop to the stuff on your shelves, and makes the shelves themselves pop – giving them a bold, personal touch. If you have a good amount of flea-market savvy, this is the paint project for you. 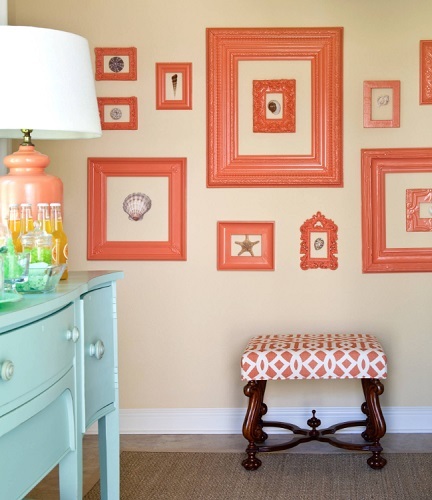 Collect some mis-matched but interestingly-shaped picture frames and then spray paint them all in a matching color to create a fun, funky, but cohesive art collage. While you can certainly buy all matching frames (or even pre-made collages of art prints), weird frames are inexpensive to buy and have a whole lot more personality. Bonus: this look works equally well whether or not you put anything in the frames. If you’re feeling bold, this technique also works great for those odd statues and trinkets you always find in thrift stores: add a coat of glossy spray paint in a vivid color to breathe new life into an odd or dated piece (and make it match with other uniquely-shaped finds). It’s a small, simple thing, but I’ve always found bright, colorful doors to be charming – whether it’s a front door, garage door, shed door, or even a bedroom door. And, as far as painting projects go, repainting a door isn’t as big an undertaking as you might think. As with furniture, you’ll want to thoroughly clean your door and remove (if possible) or mask the hardware before priming and painting. 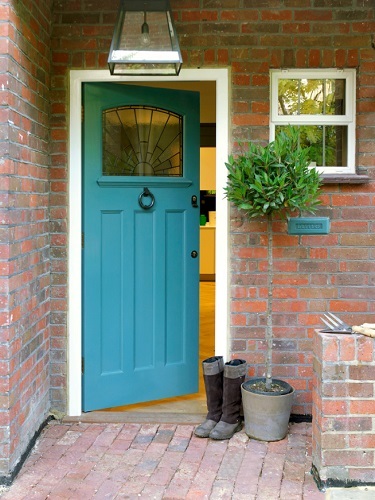 Ideally, you want to paint your door on a warm, dry day, starting early in the morning and applying coats of paint to the door with it laying flat, letting it dry completely between coats and before re-hanging the door in the evening. That said, if you can’t have an open doorway for the day, keep your hardware taped off to prevent smudges and take care not to overpaint, as applying too much paint (or too many coats too quickly) will give you a drippy, uneven finish. If you’re aiming for a big change, entirely repainting a room isn’t a bad place to start. But if you’re looking for a smaller paint project, or to experiment with color and style, you might want to consider painting a single accent wall instead. Unlike painting a whole room, you won’t have to totally disrupt all your furniture, and if you’ve been toying with the idea of painting with a really bold, vivid color, an accent wall is a great place to test the waters. Depending on what room you’re painting in, accent walls are also great for drawing attention to a certain part of the room – like acting as a faux headboard in the bedroom, highlighting your TV in a living room, or even adding a little extra pizzazz to the vanity in your bathroom. Painting a fireplace or fireplace surround has a similar impact, and all three projects use a whole lot less paint than you would need to repaint a full room. Want a slightly more unexpected paint project? Consider painting your ceiling rather than the walls. This is a bold choice – and admittedly one of the more arduous and labor-intensive paint projects on this list, but the final result can be pretty spectacular. Bright, colorful ceilings are a great choice for a kids room, while richer, deeper colors can create a soothing ambiance for a master bedroom, and light, bright tones can perk up a living space. If you have particularly high ceilings, a color that contrasts your walls can help make the space feel less cavernous, while a ceiling color that closely matches your walls can make low ceilings feel less oppressive. Chalkboard paint has been around for a while now, but it’s a fun weekend paint project that scales really well to your ambition levels: you can transform anything from a small swatch to a full room into a usable chalkboard surface, which is great for household notes, to-do and grocery lists, artists, creative kids, and even just giving your space a nice homey touch. Chalkboard paint applies just like regular paint, but has to be finished by rubbing chalk all over the dried surface and wiping it clean. Admittedly, chalkboard paint is the least colorful option on this list, but it has almost infinite room to add personality to your space – and you can always use rainbow chalk, too! Giving your home a fun, new feel doesn’t have to mean a major remodel. A brush, a can of paint, and a little elbow grease are all you really need to put a creative new twist on just about any room in your home. This entry was posted in Decorating Ideas and Tips, Latest Trends and tagged diy paint projects, furniture restoration, home design, painting ideas, weekend paint projects.